Wuhan (wǔ hàn 武汉), first termed as such in 1927, is the capital of Hubei Province (hú běi shěng 湖北省). With the population of 8,970,000 thousand residents in its urban area, it is the most populous and biggest city in central China. 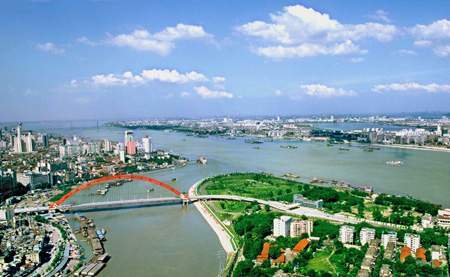 Traversed by the Yangtze River (cháng jiāng 长江) and its tributary Han River (hàn jiāng 汉江), Wuhan is divided into three parts, Wuchang (wǔ chāng 武昌), Hankou (hàn kǒu 汉口), and Hanyang (hàn yáng 汉阳). 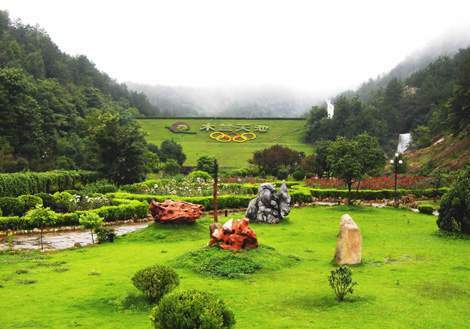 Mulan Heaven Pool Scenic Area (mù lán tiān chí fēng jǐng qū 木兰天池风景区) is located at Shimen Town (shí mén zhèn 石门镇), Huangpi District (huáng pí qū 黄陂区), Wuhan City (wǔ hàn shì 武汉市), Hubei Province, covering 4800 hectares. It is regarded as the “Jiuzhaigou Valley (jiǔ zhài gōu 九寨沟) of Hubei, Lushan Mountain (lú shān 庐山) of Wuhan”. Mulan Heaven Pool Scenic Area is divided to scenic resort and leisure resort. The main peak is 520.6 meters above sea level, which belongs to the vein of Dabie Mountains (dà bié shān xì 大别山系). There are gully aspects and lush forests, water continuously throughout the year, which shows the landscape of wetland ecosystems. It is said that General Mulan (mù lán jiāng jūn 木兰将军) watered her horse in the pool when she was on the way to the battle field. And because the pool is with high altitude, then people called this pool Mulan Heaven Pool. 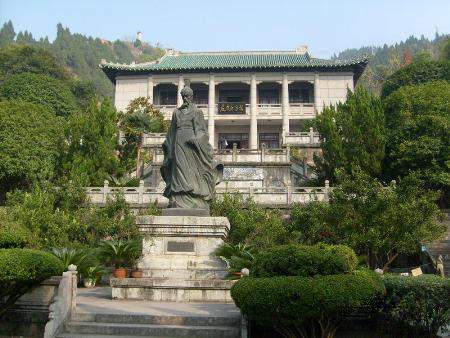 Ancient Longzhong (gǔ lóng zhōng 古隆中) is the residence of Zhuge Liang (zhū gě liàng 诸葛亮), an outstanding statesman and strategist during the Three Kingdoms (sān guó 三国) period. It is situated 13 kilometers to the west of Xiangfan (xiāng fán 襄樊) City, covering 12 square kilometers. Nowadays Ancient Longzhong is a scenic area with rich cultural, humanistic landscape, exquisite natural environment and commemorative architecture. 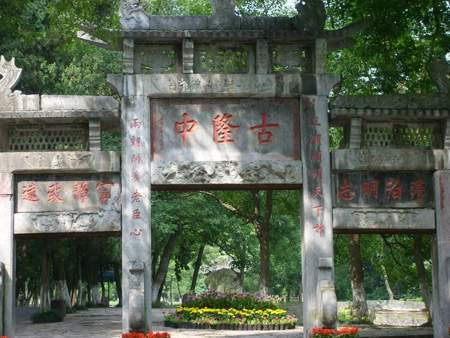 The Xianling Mausoleum (xiǎn líng 显陵) is located in a cypress valley in Songlin Mountain (sōng lín shān 松林山), 7.5 kilometers from Zhongxiang City (zhōng xiáng shì 钟祥市), Hubei Province (hú běi shěng 湖北省). It used to be called the Imperial Mausoleum (dì líng 帝陵). It occupies an area of 183.15 hectares while the additional defensive walls outside the city walls are 3600 meters in length. 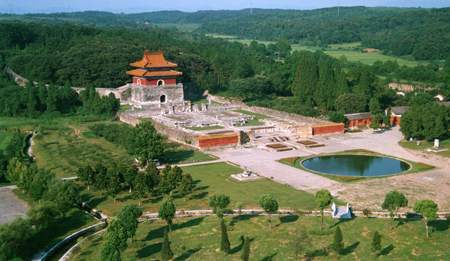 It is the largest of the 18 Ming imperial tombs. Built in 1520 and completed 20 years later, the mausoleum belonged to Zhu Youyuan (zhū yòu yuán 朱祐杬), the father of Emperor Shizong (shì zōng 世宗) of the Ming (míng 明) Dynasty (1368-1644), and his mother, surnamed Jiang (jiǎng 蒋). It was the first imperial tomb in China to be inscribed by UNESCO on the World Cultural Heritage List. Qu Yuan Ancestral Hall (qūyuáncí 屈原祠), also called Qingliegong Ancestral Hall (qīngliègōngcí 清烈公祠), located 1.5 kilometers to Zigui County (zǐguīxiàn 秭归县) at the north bank of Yangtze River, was built in Tang Yuanhe (tángyuánhé 唐元和) 15th year to commemorate Qu Yuan (qūyuán 屈原), and repeatedly repaired because of its destruction in Song (song 宋), Yuan (yuán 元), Ming (míng 明) and Qing (qīng 清) Dynasties. Later it was changed to "Qingliegong Ancestral Hall". In 1976 when Gezhou Dam (gězhōbàs 葛洲坝) was built, it was moved to Xiangjiaping (xiàngjiāpíng 向家坪) and was rebuilt according to its original condition. The present Qu Yuan Ancestral Hall was built in 1982, covers the area of more than 14000 square meters, four times larger than the previous one. The whole building is with style of unique ancient buildings in the area of the south of the lower reaches of the Yangtze River.